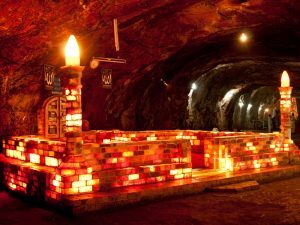 Inside the mine, a pul-e-saraat (salt bridge) leads into a figurine chamber. This pul (bridge) is a narrow walkway over 100 ft-deep salt water pool. Its unique feature is that the pool is crystal clear and you can see actually see rainbow patterns of light bouncing off salt crystals, at the bottom. It feels like you are walking on thin air. Then the chamber at the end of this rickety bridge has figurines carved in the salt rock surface. Some say it resembles Allama Iqbal and there is another one that looks like the Great Wall of China. Pakistan could make a fortune if they allow tourists to float on the high concentration brine pools—as this water doesn’t let people drown—like the dead sea. It’s a cool 18 degrees Celsius year-round in the 17 stories high, 45 km tunnels. While its blazing hot outside, you can enjoy a cool springtime breeze inside. The electric single gauge train that runs through the main tunnel is more than 150 years old—but works fine. 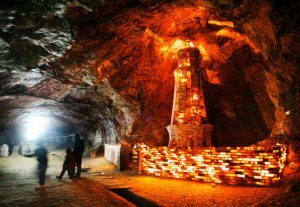 The low humidity, salt-laden air really does clear your lungs and you feel refreshed in the 2 hours tour through the mine. Natural salt formations and geometrical patterns are awe-inspiring. It’s a better idea to pay a tour guide Rs 1000 and he might take you to some of the least visited tombs. That’s where is real beauty is. Remnants of the British Raj like the Chief engineer’s residence, offices, train station, Hindu temple, church and vintage train engine are still in a time capsule. It’s like strolling through British Raj days with Dr. Warth (Chief miner) and Viceroy Mayo (Khewra mine was named after him) just around the corner. Himalayan salt is actually Khewara salt with its 1% content of potassium, magnesium, and calcium—all essential minerals for humans. Khewara, by the way, is 500 Kms West of Himalayas. This salt color ranges from off-white to deep pink and is considered a delicacy in the western world. So the legend of Alexander’s horses cured by this salt was true after all. The British Colonials shot dead 12 protesting miners at the mouth of the mine in 1870s, while they were asking for better working conditions. The English wanted more production. This mine was identified by Alexander in BC times, passed on to Moghul Akbar then to Gakhar-Rajas, further on to Ranjit-Hari Singh combine and finally to British Sarkar. Three Hindu families (washerman trade) from the colonial times still live here in total isolation and poverty. One of them runs a souvenir shop. 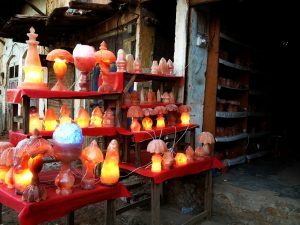 Don’t forget to take home a Khewra salt bedside lamp from the souvenir shop. It clears up the bedroom of dust and absorbs moisture. It’s very good for people with asthma and mucus issues. 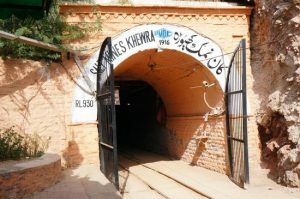 Go to Khewra if you want to see something different from the mundane—and don’t complain about the filth. I intend to visit the adjoining mines in future—that’s where the real beauty lies. Feminism At Stake- Are We Fighting An Unconquerable War?